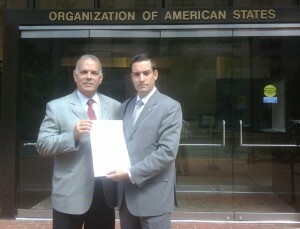 The indictment was filed this morning at the headquarters of the IACHR (located in this capital), by Venezuelan Alejandro Pena Esclusa and the Colombian attorney Jaime Arturo Restrepo (President and Legal Director of UnoAmerica, respectively) representing dozens of NGOs belonging to UnoAmerica. The indictment blames Chavez for the violence deployed on July 5, in the Toncontín Airport (Tegucigalpa), where a young man died; and for violating the airspace of Honduras, by sending a plane piloted by Venezuelan military. The document submitted by UnoAmerica includes a summary (supported with videos) of verbal abuse, incitement to violence, calls for a military insurrection and war threats, uttered by Chávez against Honduras, including the direct threat to overthrow President Micheletti. Next, the document recounts (also well supported) several aggressions, threats and acts of war carried out against the Colombian people and the government of Álvaro Uribe , beginning in March 2008, when Chavez ordered the deployment of troops to the border; up to this date, when he threatened to go to war against Colombia, when Uribe decided to sign an agreement with the United States for a joint effort to fight against drug trafficking and narco-terrorism. UnoAmerica accuses Chavez launching “interventionist actions, expansionism, violence and acts of war, with the aim of exporting his model to other nations, based on the so-called Socialism of the XXI Century”, and calls the IACHR to determine “the Venezuelan government’s responsibility for inciting bloodshed, and for committing crimes in demerit of human rights in Latin America “. “The president of Venezuela, Hugo Chávez , exceeds and violates the tenets of the Declaration of Principles on Freedom of Expression. He is clearly violating Section 5 of Article 13 of the American Convention Human Rights. He is violating legal rights enshrined in the Charter of the American Convention. 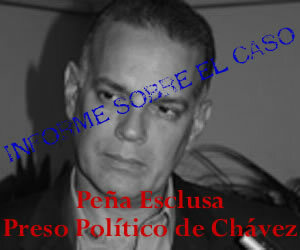 He is risking peace and the safety of the population in Honduras and Colombia. ” UnoAmerica is a platform that unifies more than 200 Latin American NGOs, belonging to Argentina, Brazil, Bolivia, Colombia, Peru, Honduras, Venezuela and Uruguay. It also brings together Latin American organizations based in the U.S. and Spain.